Back again to roundup the joy with their 31-day charity livestream is the fantastic team behind Yogscast - and you will NOT believe how much money they've raised for charity already (unless you've read the headline...). At the time of writing, there are still 16 days left in the year and these incredible bunch of gamers have raised nearly $2,000,000 already! 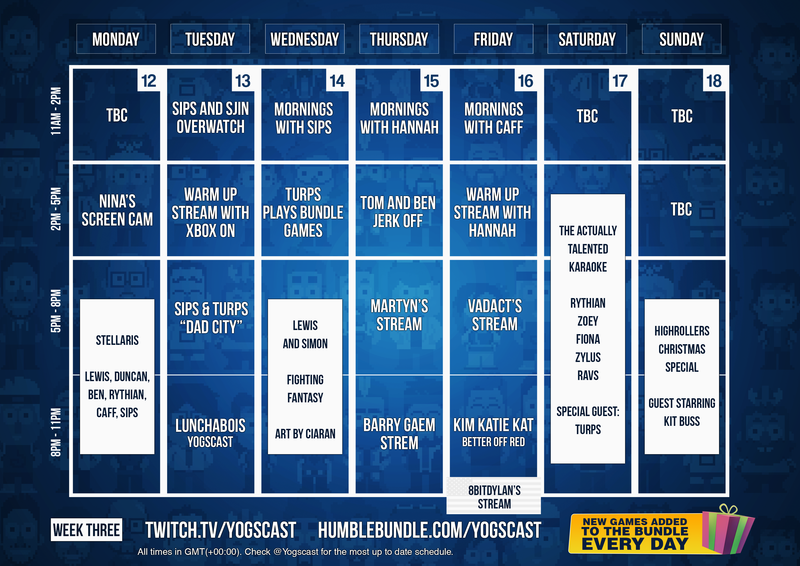 Accompanying their 24/7 livestream over on Twitch, Yogscast are encouraging all their viewers and fans to donate money to their Jingle Jam partner - Humble Bundle. Humble Bundle is a fantastic way for people to donate however much money they want to unlock dozens of games on Steam without the pressure of having to donate LOADS to unlock the best tier titles. With a new game being announced every single day, anyone who donates to the Jingle Jam will currently be able to get over $650 worth of games for as little as Ł30! Now we can't share the Twitch embed code on the site, but if you head over to their YouTube channel you'll be able to check out this years highlights - such as the one above! With games up for grabs such as Team Fortress 2, Kholat, Psychonauts and Goat Simulator, we can't think of a better way to get involved with charity. So what are you waiting for?! Help increase the Jingle Jam counter from $1,714,834.90 raised to like a bajillion dollars! Here's a full schedule for the rest of this week in the Yogscast Jingle Jam - but follow this link to see how they'll be playing out the end of December! This year, Yogscast are supporting the following charities: The Mental Health Foundation, Cancer Research UK, Whale and Dolphin Conservation, Special Effect, GamesAid and the ILGA (International Lesbian, Gay, Bisexual, Trans and Intersex Association). So make sure you help them out!